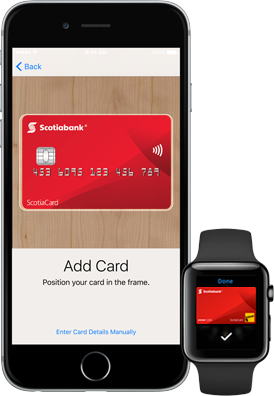 Scotiabank launched support for Apple Pay back in May, alongside TD and BMO, following closely behind RBC and CIBC. The financial institution has since launched an Apple Pay promo to get customers enticed to setting up their debit and credit cards on their iPhones and Apple Watches, offering them 10% cash back on everyday purchases—up to $20 max—and available only to the first 50,000 customers. Add your eligible Scotiabank debit and credit cards to Apple Pay, and get 10% cash back on your everyday purchases – up to a maximum of $20 – on the first card you use! This offer is available to our first 50,000 customers who make Apple Pay purchases. The first 50,000 customers to use Apple Pay to make a purchase between July 10, 2016 and September 30, 2016, will be eligible for 10% cash back (up to $20). Cash Back bonuses will be credited to accounts in December 2016, as long as your account remains open and is in good standing. Scotiabank says they may cancel or change the offer at anytime, without notifying customers. Apple Pay is available on iPhone 6s, iPhone 6s Plus, iPhone 6, iPhone 6 Plus, iPhone SE, iPad Pro, iPad Air 2, iPad mini 4, iPad mini 3, and any Apple Watch paired with iPhone 5 or later. Let us know if you received this email from Scotiabank, and if you’re already on your way earning some cash back with Apple Pay. Meanwhile, in the UK and US, Apple retail stores are offering customers $5 in iTunes credits if they setup Apple Pay on the spot. No word if this promo from Apple will come to Canada or not. 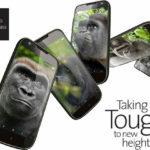 Corning Unveils Gorilla Glass 5, Likely Candidate for iPhone 7?